That amounts to $34,675 a year. How much do you have to earn to net that amount to spend it all? Just the spending equals $16.67 an hour for a typical work year. Credit cards you say? Who knows? This information does not mean anything to me. With gross household income of $19,644 per year and 40% of that going to paying down debt. I spend about $100.00 per week on food, no extras. No one I know is spending anything close to those numbers. No family making the average household income of $54,000 per year is spending that kind of money every day. I would think you would have to make between 80 K to 100 K per year to spend anything like $95 per day. 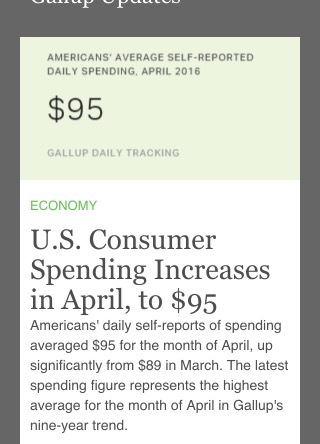 The millionaires and billionaires must be spending like made to bring the average up to $95 per day, lol.